their numbers and threaten their survival. As an environmental stewardship and research organization, the FRSCS brings together leaders, all areas of government and First Nations, commercial and recreational fishing sectors, research and education to work together and make a difference for Fraser River white sturgeon. 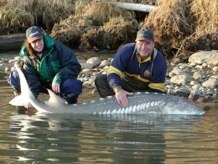 Guided by the inspiring leadership of founding, and now honourary Chair, Rick Hansen, we focus our resources and talents towards helping the white sturgeon populations in the Fraser River to become strong, healthy and naturally sustainable for future generations. •Are threatened and need our help!